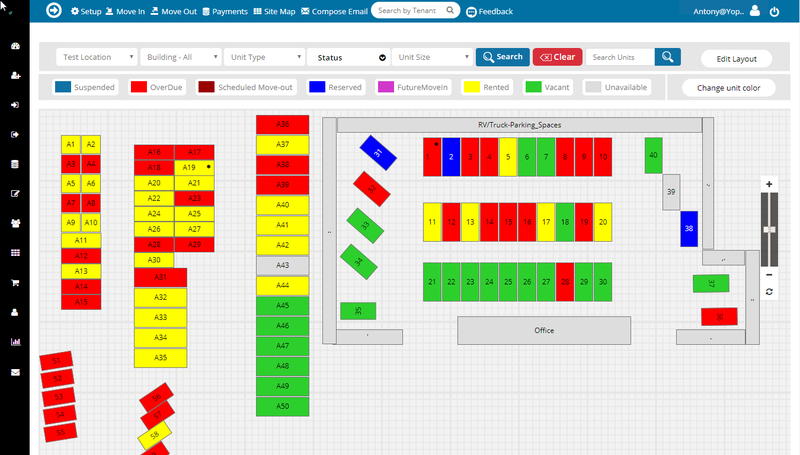 You can manage the entire facility from sitemap. Everything is possible in just clicks. You could see Site Map button from the top quick menu. It will take you to the bird's eye view of facility. We avail you with several filters to proceed with any operations in your facility. Select Location from the dropdown. Selection based on Unit Size. 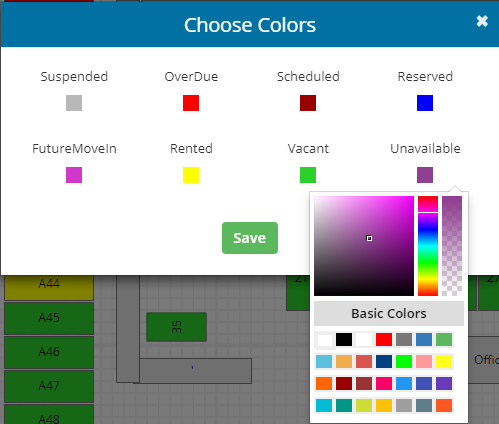 You can choose any customized color for each unit status. You can also filter based on unit status. You can use the Navigator, Zoom In & Zoom Out to access the entire facility map. Also you can click on Re-center button to come back to original position. 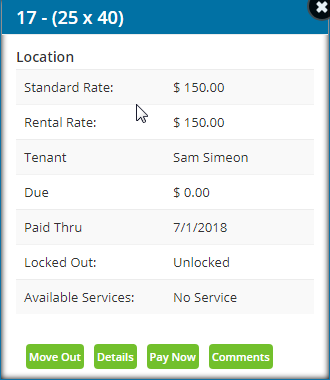 Click on any unoccupied unit and you can Move In or edit the unit information. 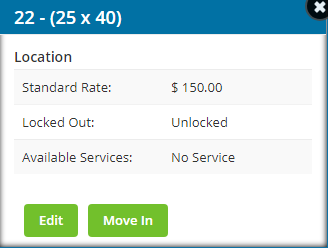 Click on any occupied unit and you can Move Out, view unit details, Proceed to Payment or Add comments. You can arrange your sitemap as per your facility layout. To align or edit any units in different position or to resize, rotate, drag, and turn the grid lines ON/OFF, Click on Edit Layout. On click you will be redirected to the edit mode. Step 11: You can choose the Location, Building based on the dropdown and proceed to edit the layout. Step 12: To edit the Layout you can select the operations provided at the edit bar which is at the right center of the sitemap. Drag allows you move the units. You can also select Multiple units and drag to different position. Rotate allows you to keep your units in any degree or position. Resize allows you to drag an enlarge or shrink the unit size as required. Select Multiple units and perform operation as Drag, Rotate or Resize. You can select All Units and click on Ascending Order to organize all the units in ascending or select Multiple Units and perform the operation. You can select All Units and click on Descending Order to organize all the units in Descending or select Multiple Units and perform the operation. You can select All Units and click on Vertical Order to organize all the units in Vertical or select Multiple Units and perform the operation. Save button allows you to update the modified changes in the layout. Note: We insist you to save the changes for every 10 minutes. You can cancel all the unsaved changes and go back to the sitemap. You can view the changes by clicking on save button. Perform all operations under one roof and make your facility management to be On Click method.